The Contract was a pretty good thriller. Frank Carden (Freeman) is a hitman about to do another job when he is sidetracked by a car accident. His cover is blown and the authorities are bringing him to Washington. 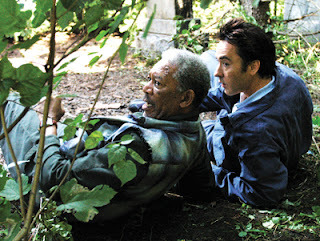 But Carden escapes into the woods and meets Ray Keene (Cusack) and his son. With the cops and other hitmen after them, they have to escape. Freeman and Cusack put in their usual professionalism. It's fun to see Freeman as the bad guy. 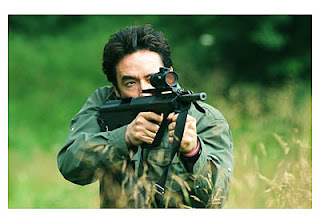 Cusack gets to kill a few people too. 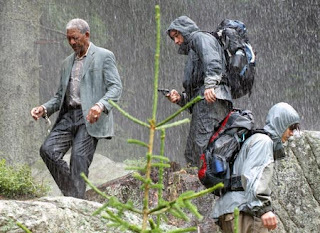 The action scenes are well-shot and the scenery in Bulgaria looks beautiful. The only thing that's odd is why two top-drawer actors would be drawn to a project fit for Eric Roberts or Michael Pare, but it works. 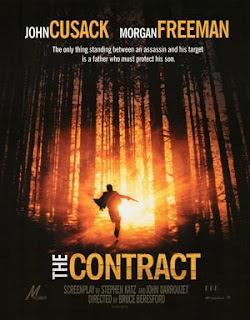 The Contract is one of the biggest DTV movies of the year and it's definitely worth seeing. It's a good couch-potato flick. I can't wait to see it. Cusack is the man. don't watch this film for god's sake, there's a reason it went straight to dvd.